If you are a developer, tester, or a manager, sometimes understanding various methods of API can be a challenge when building and consuming the application. 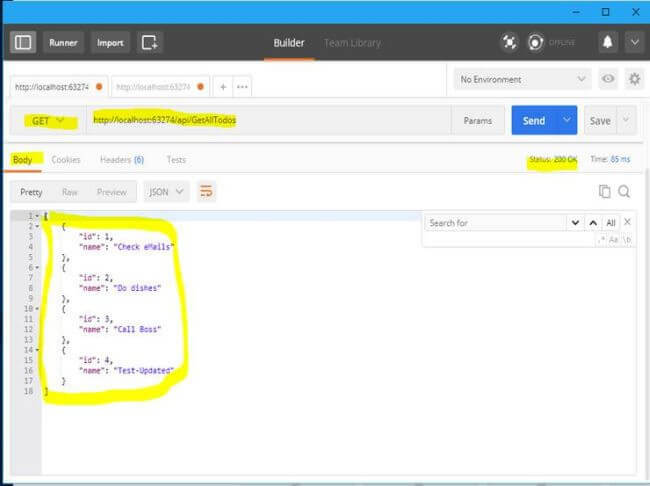 Generating good documentation and help pages for your Web API using Postman with .NET Core is as easy as making some HTTP calls. Let’s start downloading simple To-do projects from GitHub. Download and run the below TodoMvcSolution from this link. 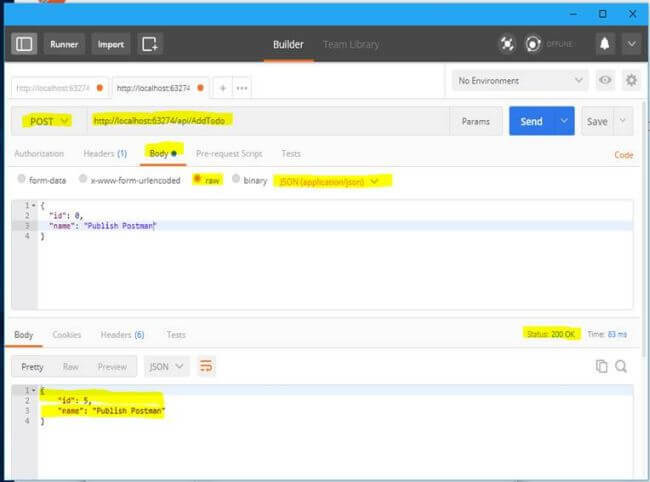 Postman is a Google Chrome application for testing API calls. You can download and install Postman from below web site. 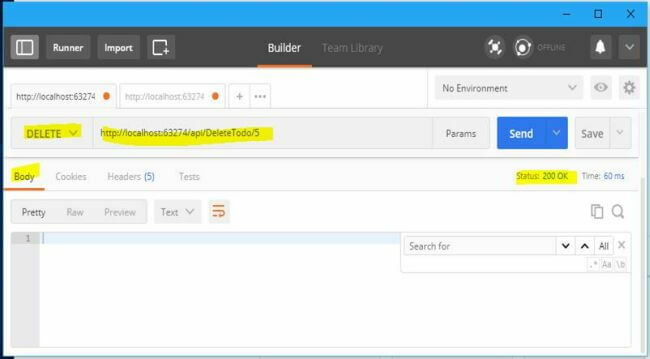 Here are the APIs we can test - Get, Post, Put and Delete for this application. 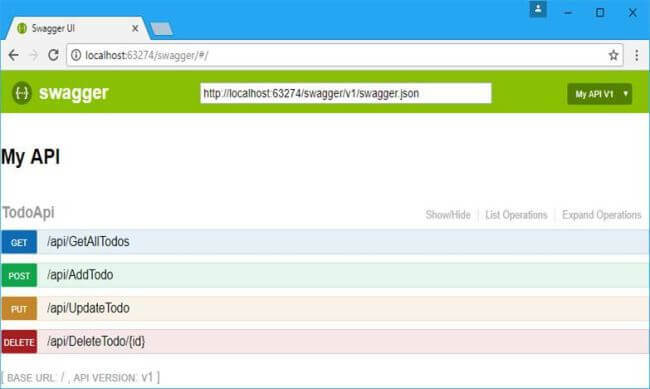 Here are the Web APIs we want to test. //Copyright 2017 (c) SmartIT. All rights reserved. Note - Your local port number may be different than mine. Use your local port number. Testing GET is very easy. First, we need to set HTTP Action from the drop-down list as GET. Then, we need to type or paste into the API URL box. Then, click the blue SEND button. If the GET is successful, we see the status: 200 OK.
First, we need to set Http Action from the dropdown list as POST. 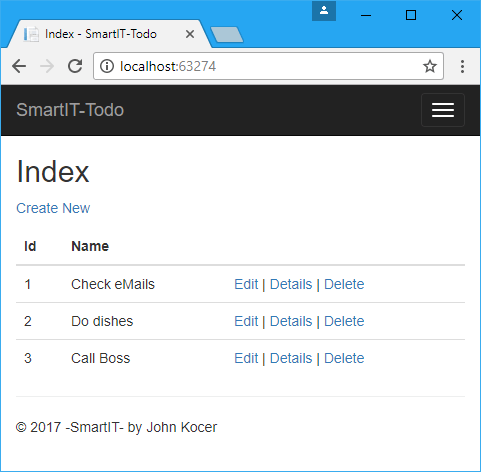 AddTodo API accepts a Todo object in JSON format. We need to pass a new Todo JSON data. To pass JSON data we need to Select Body Tap. Select JSON(Application/JSON) as text format. Write or paste your Todo JSON data. If the POST is successful, we see the status: 200 OK.
You will see Status:200 for success and the return value in the Return Body tab. We sent Publish Postman Todo item with id=0 and we received id=5 as result. First, we need to set HTTP Action from the dropdown list as PUT. Then, we need to type or paste into the API URL. UpdateTodo API accepts a Todo object in JSON format. We need to pass an existing Todo JSON data. If the PUT is successful, we see the status: 200 OK.
You will see Status:200 for success and the return value in the Return Body Tab. We sent Publish Postman Todo item with "name": "Publish Postman-In progress" and we receive an updated todo result. First, we need to set Http Action from the dropdown list as DELETE. DeleteTodo/5 API accepts an id on the We need to pass an existing Todo with an Id value. If the Delete is successful, we see the status: 200 OK. This will complete the Postman Part 1 tutorial. 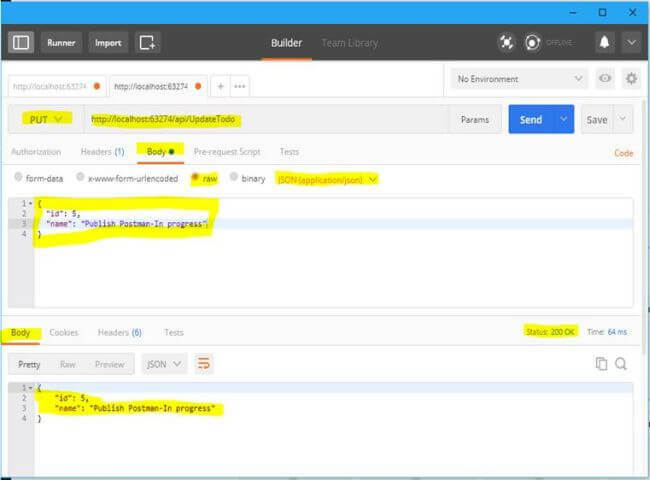 In "Part 2- Automated testing with Postman", we will look into automating Postman API testing and writing a script to run continuous integration test case. 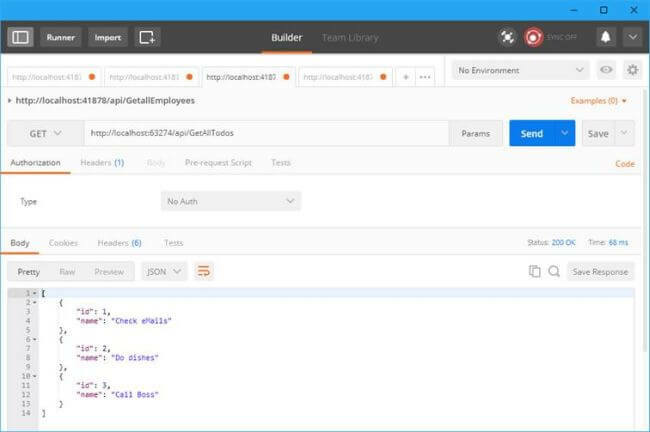 In this article, we learned how to use Postman with ASP.NET Core Web APIs. Download source code from GitHub. Thank you for reading this article. You may be interested in reading the following training articles too.